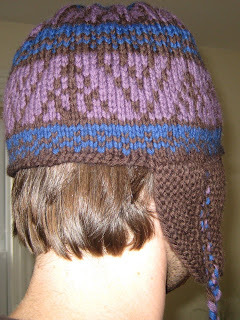 Early this year, I searched for the perfect ear flap hat pattern, wanting to make one for my boyfriend. I finally located a pattern that works for him that would also be fun for me to make: The Deathly Hallows Fair Isle Hat. This pattern was inspired by the symbols of the deathly hallows (line - wand, circle - stone, triangle - cloak) in the seventh and final Harry Potter book. The look of this hat is subtle enough that you can wear a Harry Potter hat with only the people you choose to tell understanding. Unfortunately,the pattern only included the knitting chart for the hat, and not a complete hat pattern. 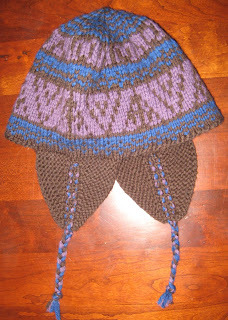 I constructed the ear flaps using two strands of WoTA yarn following the vinter lue pattern from knitty.com. 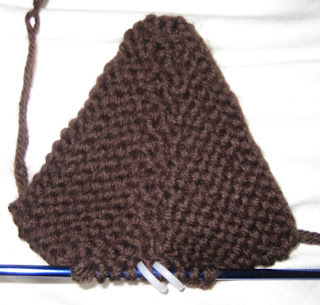 I then constructed the hat as follows: Cast on 108 sts on size 7 circular needles (six repeats of18 stitches). Earflaps were attached as described casting on necessary stitches to bring the total number to 108 (I picked up 21 stitches from each earflap, and the CO with the backwards loop method 33 sts on each side to get the correct number). The entire hat consumed two 50 g skeins of Fedora (MC), and less than one each of Lullaby and Winter Night. I knit one round in MC before starting the pattern. Finally, to block the curling edge, I loosely stitched the ends together, and soaked the entire hat in luke warm water. Once the hat was dry, I removed the stitches and the edge was flat!